A few years after Adolf III von Schauenburg had founded a ‘new town’ on the ruins of the Neue Burg on the other side of the bishop’s castle with the cathedral, the newly settled citizens demanded a church of their own. Count Adolf had a small chapel built, about 12 by 26 metres in size, which could accommodate about 300 people as it was customary at the time to stand or kneel during the service. This was in 1195, about six years after the embankment at the Alster, which separated the old quarter of the town from the new one, had been raised and the first houses had been built on the landside (which today is Deichstrasse). This chapel was dedicated to St Nikolaus, a bishop of Myra in Lycia (Asia Minor); he was said to have rescued many people in distress at sea in his capacity as a merchant seafarer and also helped the poor with generous alms. This was why the new citizens – themselves merchants and seafarers – had chosen him as their patron saint. At the time, many churches along the coasts of northern Germany were dedicated to this saint. Over the following centuries the building was repeatedly enlarged as walls like shells were erected around the original edifice. The first enlargement, built in the years between 1240 and 1250, included the chapel, using it as choir. Three naves with three bays formed an almost square floor plan. The central nave with a height of about 22 metres was only a little wider and slightly higher than the side aisles so that an evenly vaulted ‘hall’ complemented the naturally much lower former chapel. The second enlargement followed about 150 years later, between 1384 and 1400, when another bay and a tower base flanked by two chapels of equal height were added. On important church holidays the church could now accommodate 1,500 people. In the years from 1400 to 1425 the church was enlarged for the last time; the old chapel was modified as a new apse with chapels was added. 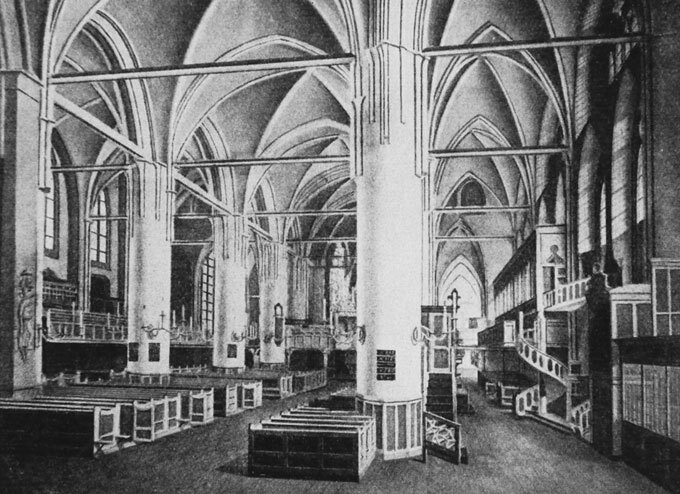 Forming the last shell, a number of other additions followed, such as a vestry with a Herrensaal (church hall) and further chapels with finally 22 altars. There were also a number of lean-tos against the church walls, consisting of dwellings and workshops, so that the building finally stood out of a jumble of gables and roofs. All modifications and additions consisted of the same material, i.e. the Nordic red brick which during the early phase resulted in simple natural shapes. This was in particular reflected in the free-standing outer walls which in the early years were structured only by buttresses. In this respect St. Nikolai did not differ from the other parish churches in the old part of the town. However, while the naves of those churches which were also built as ‘halls’ were covered by one single high saddle-back roof, St. Nikolai had a separate roof for each of its naves. Over three-hundred years this showed in the typical west facade with a tower flanked by two gables which gave the church its highly individual character that is still known today as it was captured in numerous engravings. A church tower was added at a much later point (1517). Lightning strokes and fires as well as structural flaws which caused the structure to collapse led to other towers being built; this is reflected in pictures of the town from different centuries. The first rather compact tower was followed by a second one in 1593 which in 1656/57 was replaced by the slim Baroque tower by Peter Marquardt which reached a height of almost 128 metres and is still known today. All towers had clockworks which were always installed at such a level that they could be seen from every place in Hamburg and thus served as public clocks for the Hanseatic city. This last tower stood until the afternoon of 5 May 1842, when the Great Fire – starting in Deichstrasse – also engulfed St. Nikolai. 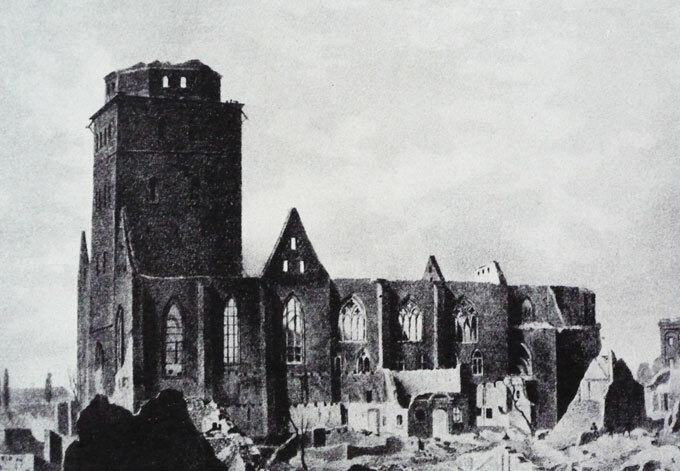 In only four days about one third of the entire city burnt down; all that remained of the church was the stump of the tower and some of the outer walls. All the ruins were demolished and sacrificed for realigning the Hopfenmarkt and adjacent streets. A building site for a new church was designated a bit further to the east. 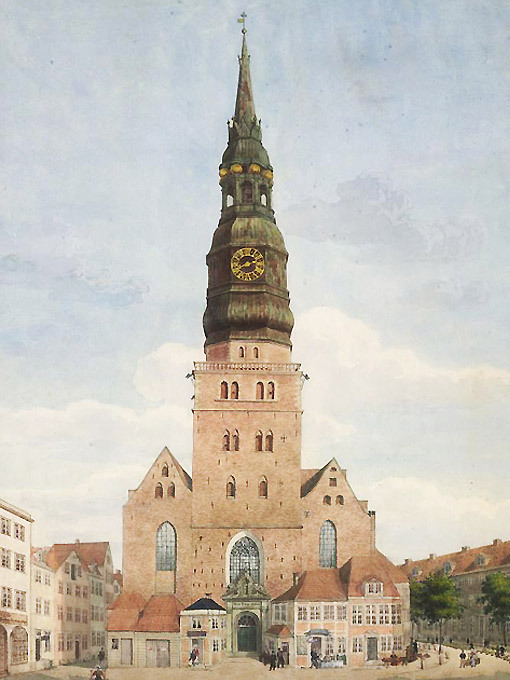 Today only the engravings that are still displayed in many houses in Hamburg and a few contemporary reports remind us of this church with its slim Baroque tower which used to be Hamburg’s largest parish church.